After stabilizing the boresight in fine-pointing mode, using the instrument as a super star tracker, teams at CNES and French national scientific research centre CNRS have acquired the 1st images on COROT’s exoplanet channel. Early evaluation of data quality enabled COROT mission teams to begin acquiring the 1st science data on 3 February. This phase will continue until the satellite is rotated toward a new star field, a manoeuvre scheduled for 2 April. The science community has been eagerly these 1st science data, returned only 5 weeks after launch following the flawless operation of the satellite and its systems. This fine success for CNES is a tribute to the agency’s engineering expertise. 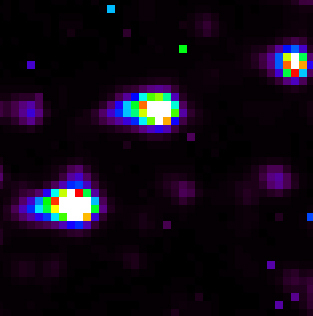 These false-colour images highlight luminous intensity: blue stars are the least bright and white stars the brightest. 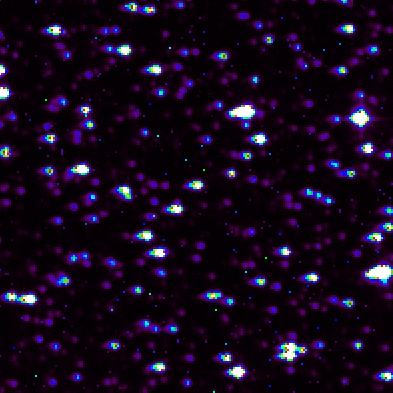 A star field observed by COROT..
White stars with a vertical line through them are too bright to be studied by COROT, as they saturate the CCD sensor. 50 stars observed by COROT. Image covering a field of view of 0.25° x 0.25°. COROT can only study the objects that appear white. 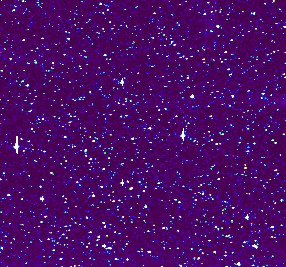 Close-up of the centre of the previous image, showing 3 stars that COROT will study. The larger patches in the image are stars with higher surface temperatures. In-orbit checkout—signalling the handover to operations teams who will be putting the satellite through its paces to gauge overall performance—should be completed by end March. The objective of this 1st observation campaign is to finely tune the light curve processing system. Scientists are expecting to glean valuable data due to the excellent quality of the field observed, which contains some very good targets for stellar seismology and will also be ideal for viewing on the exoplanet channel.